This page contains land mine awareness education/campaign programme description, experience learned from this programme and actual materials (e.g. posters, brocures and handouts) developed for this programme. 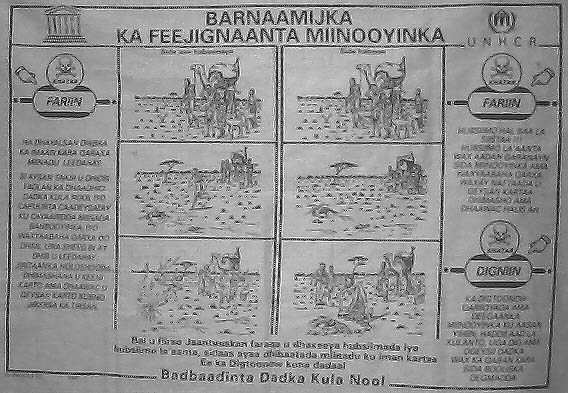 "SMAC: ololaha ka feeijignaanta miinooyinka"
This is a brochure with pictures and simple directions to teach people what to do when they find land mines. Developed by UNESCO E.D.C. in 1994. This package of land mine awareness campaign materials comes with three handouts and pamphlets in Somali. Produced by UNESCO and UNHCR. This is a120 cm x 100 cm banner to promote mine awareness campaign in Somalia. Produced by UNESCO and UNHCR. 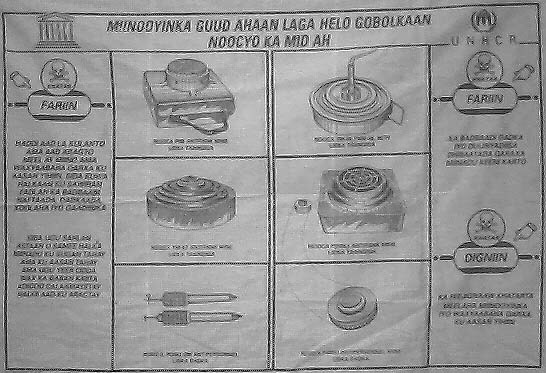 This is a 120 cm x 100 cm banner which shows different kinds of landmines found in the city of Gobolkaan in Somalia. Produced by UNESCO and UNHCR.